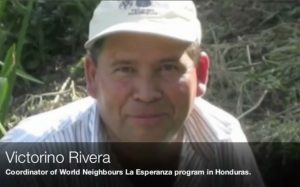 World Neighbours Canada directors learned yesterday of the death of Victorino Rivera Flores, the first local trainer hired by WNC in the 1980s in Honduras. Victorino was instrumental in motivating and developing program activities in the El Socorro region of that country. Graem Nelson met Victorino several times and has written a moving tribute about this man and has included some vivid personal memories. Graem’s tribute follows … “I was very sad to hear of the death of Victorino Rivera Flores. He will be mourned by his wife Senia and quite a few children, I can recall five at least. And probably by now, some grandchildren. In 1989, I led a trip of Rotarians to Honduras to meet with the Siguatepeque Rotary Club and World Neighbors Oklahoma staff. The Rotarians included Michael Newman, who was my friend in Oliver, new to Rotary and on his first trip to a “less developed country”. It also included Bob Ellis, who went on to found The Gleaners in Oliver, influenced by his first glimpse of real poverty in the countryside and cities of Honduras. After getting settled in at Siguatepeque and meeting our Rotary counterparts, we all went to lunch at a fish restaurant at Lake Yojoa. Dr. Miriam Dagen was the temporary area representative for World Neighbors and she welcomed our group to the lunch. We met a young volunteer World Neighbors trainer named Victorino Rivera. He had been working as a farmer trainer at the WN program at El Rosario, a mining village not very distant from Siguatepeque. Victorino was proposed as the leader of the program at El Socorro, which would become the first program funded by WNCanada. With some amazing help from Rotary that continues to this day. Victorino was already a big young man. He had an infectious grin that spread from ear to ear. He had intelligence, charisma and humour. Our Rotary group was very happy to give him a chance to be a WN program coordinator. Victorino quickly recruited a fine staff of farmer volunteers to get going on the development program. It included a progressive local farmer whose farm included a neglected hillside visible from the highway. This is where Victorino decided to establish the demonstration plot, where it could be seen by everyone who passed. The transformation of this rocky hillside into a beautiful terraced garden took a year of work; it was remarkable and was noted by everyone who passed. Victorino’s charisma attracted dedicated and enthusiastic volunteers, including women in a society where women had little power. I won’t list all the accomplishments of his program, but the work transformed the village of El Socorro from a place of discouragement and poverty to a place of hope and accomplishment. 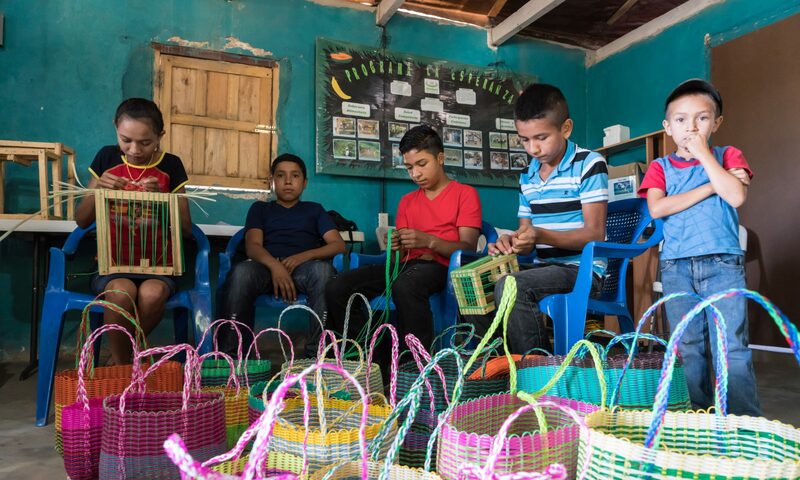 It only took a couple of years before the annual visit of the Rotarian sponsors met, instead of discouraged campesinos with their eyes downcast, eager citizens who looked us right in the eye and proclaimed their hopes for a new aspect of the program. It seemed like a miracle to me, and Victorino was the centre of it: the leader of the miracle. Victorino married Senia and, with his earnings, bought a piece of land at El Porvenir where he built a house. He and Senia started having kids and I thought they might never stop. An evangelical Catholic, Victorino acknowledged with a chuckle that he was not the right program leader to encourage birth control among the program participants. A couple of anecdotes about Victorino come to mind. Around 1993, Victorino came to Canada. We visited Vancouver and stayed at the home of a relative who had a golden retriever named Bromley. Bromley had his big pillow next to the fireplace, where he dozed in comfort. Victorino observed that dogs in Canada lived better than rich people in Honduras. We all laughed but he was not joking. “Better accommodation, better health care, better security, better food”, he observed. On that visit, one of the Oliver Rotarians, Vern Hupp, offered to take Victorino up in his single-engine plane. The Rotarians watched as Vern did barrel rolls over Oliver airport. After landing, Victorino got out and walked unsteadily over to our group, a big grin on his face. How was it, we asked. “Mis bolas estaban en mi boca,” Victorino whispered, never losing his grin. I recall that after 5 years or so, Victorino went to work for Catholic Relief Services and after that, he returned to World Neighbours. By then, Michael Newman had taken over responsibility for the Honduras programs and I never saw Victorino again. We exchanged Christmas cards for many years. He must have been around 50 when he died this week. When we met, Victorino had very little schooling. He was brilliant and wise, that was undeniable. He was disciplined. Over the next five years, using the Honduras Radio School, he put himself through Grade 6 and I believe he went well into high school, in his “spare” time and on his own dime.